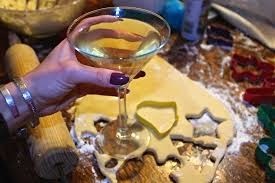 Clear the kitchen and block all phone calls…it’s time for my annual Christmas Cookies Bake-a-Thon. I love dessert but must admit I’m not the best baker in the world. Don’t have the “hand” as my Grandma used to say. If a recipe calls for yeast, kneading or rising, I don’t make it. But when it comes to cookies, I taught that big blue crumb-munching monster everything he knows. Of course, there was that one unfortunate incident that almost caused me to hang up my apron for good. After numerous attempts to bake chocolate chip cookies had failed, my friend, Suze, called me for help. Frustrated and desperate to succeed, she asked if we could make a batch together. Cookie aficionado that I am, I agreed to show her how to make the easiest cookies in the world correctly. They flopped. It’s not that my oven’s humming all the time, mind you. I’m no competition for Mrs.Fields. Once every few months you might walk into my house and catch the sweet smell of homemade goodies wafting through the house. But when the holidays approach, things change. Every year at this time I vow I’m only going to bake one or two batches and every year it’s the same old story. The members of my family have their cookie favorites, but no one likes anyone else’s favorites. So I have to bake fifteen different batches, which yields about 500 cookies. Do you know how much Tupperware it takes to store 500 cookies? I had to become a sales rep just to get my supply at wholesale. Storage is another challenge. Hint - don’t go into my garage looking for a hammer. Then there’s the time factor. Can you guess how long it takes to bake that many cookies when you start a few days before Christmas? Hey, I was busy! Least favorite part of cookie baking? The clean-up. I don’t believe in the wash as you go method, so when the bake-a-thon is over, every bowl, spoon, wall and counter top in my kitchen is covered in either flour or batter splatter. It’s not a pretty sight. Last year at this time, hubby Garth hid out at the Holiday Inn for a week just to avoid the mess. Smart guy. Obviously they don’t appreciate the finer culinary delights of five pounds of butter and six bags of white sugar combined into sheer bliss. I might complain about the cookie baking stress and mess, but there’s no way I would ever celebrate Christmas without my beloved treats. So this year I’ve come up with a new method to get me through the bake-a-thon. Instead of putting the bourbon in the Kentucky cordial delights, I’m going to put it in a glass over ice. The cookies might not turn out just right, but I predict I won’t care in the least. I just giggled and grinned through your three latest posts and I've gotta say---from one cookie monster to another: Me want recipes! Me no like resolutions! Me go fast too! Geez, it's like we're related or something.